Contained here is an illustrated, step-by-step guide to the installation and configuration. Home Router/Switch/Hub/Firewall help is here also to enable DCC chat and file sending (yeah, nekkid pictures!!!). This step by step illustrated guide has been tested many times over! Now, click the Next button. You're almost done! Check Launch mIRC and then click Finish. Go on to the next section. Below is an example that will connect you to the DALnet IRC networks and place you in the channel #abpp (no "m" at the end). NOTE: The 'backup' room is on RelicNet and is called #abppm (with "m" at the end). 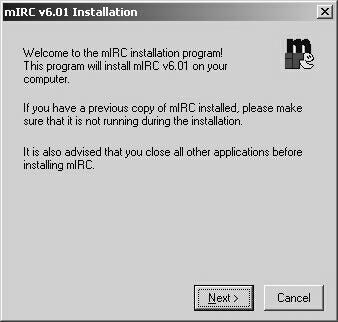 You will see an About mIRC window. Close this window. 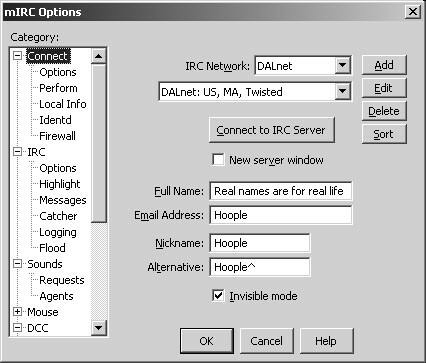 Now, you need to make sure that the IRC Network: is set to DALnet, and that the next window down is set to a server nearest to where you live. There is more advanced help on server choice at the end of this document in the section titled Other useful Resources. Now, you see that little left hand section, called Category: Click on Identd (you may need expand Connect to see it). 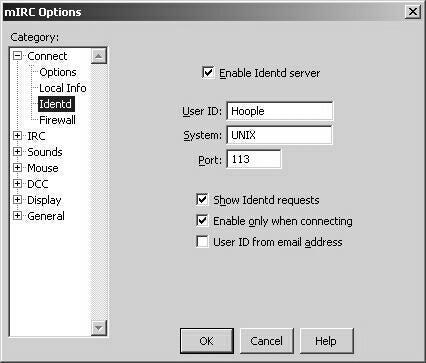 Check Enable Identd Server. This will enable the IRC servers to be able to recognize you. You may be able to connect for short periods without this option, but I highly recommend it. Getting disconnected a lot? Could be this isn't setup right! If you're a broadband user, I can almost guarantee that you will need this option. No spaces are allowed in the User ID: field. Don't change the System or Port information. 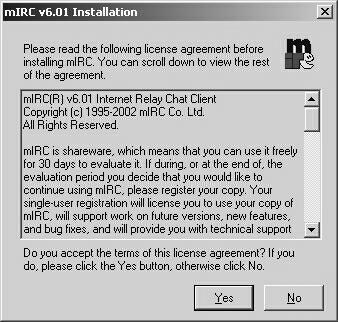 For Direct Client to Client (DCC) chat and send to work properly you need to tell mIRC how to get your correct internet IP address. 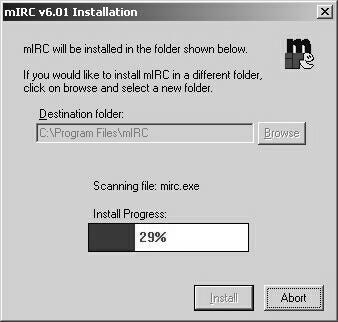 Frequently mIRC has the wrong information on your IP and it breaks the DCC chat/send. b) Clear the Local Host and IP Address fields. If anything is in them mIRC will refill them with the correct info the next time you connect. c) Check the Local Host and IP Address check boxes. d) Select the Server under Lookup method (VERY IMPORTANT!!!). e) OK to all and close mIRC. This forces mIRC to get your public internet IP Address. You may have to update this information manually from time to time as the Server method depends on the server not being too busy to do the job (you might check it at one point and find it blank!). This is the IP Address mIRC will use when you do /dcc send or /dcc chat. Part of the confusion about DCC (Direct Client to Client) Chat and DCC File Send is that it's assumed that the IRC client is making an outgoing connection. 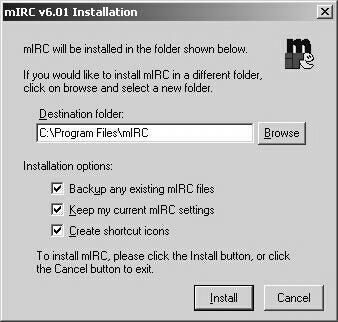 mIRC (and all other IRC clients) creates a "Listening" socket on your computer. 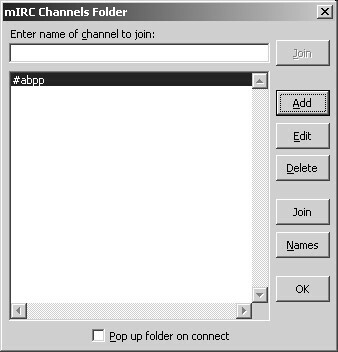 mIRC then sends a DCC Chat or Send request to the remote user in a CTCP packet. This packet includes the users IP address and the Listening socket port number. The remote user is the one that actually makes an outgoing connection to the initiating mIRC client (to the listening socket). 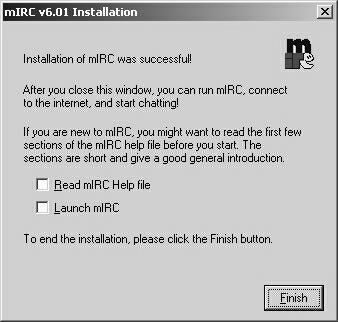 mIRC should be open at the Connect screen. Verify that Random US DALnet server is NOT selected (one geographically close to you should be). 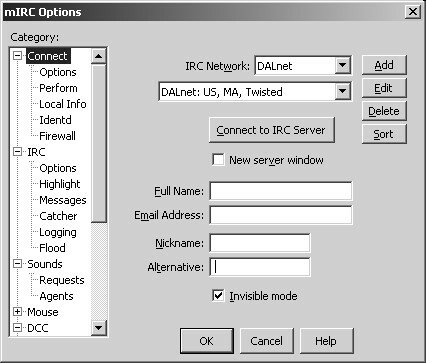 Click Connect to IRC Server. The mIRC program is going to do a lot of things, and for a while it may look like anything is happening. Give it some time and be patient. It will eventually pop up a screen that is called mIRC Channels Folder. On busy nights it's not unusual to take more than a minute or two to connect. Click Add. Fill in #abpp in the Channel: field (no "m" at the end). Click OK.
Now, just start typing, and enjoy! Just one tip about IRC for newbies: when you connect to the room it may take a while for those in the room to respond to you. One reason is network delays which can be as much as 10 seconds (or more on bad day). The other reason is they may be busy in another window or away from the keyboard for a moment and haven't seen you yet. So, that said, sit back and wait at least 3 minutes before clicking the X and muttering explicatives! Identd - The Identify Daemon (IdentD) must be reachable on port 113 to allow the latest server authentication to work properly. Many Routers/Hubs/Switches handle this ports forwarding auto magically now and no action is required on your part. Many IRC networks will not let you join them without IdentD working properly. 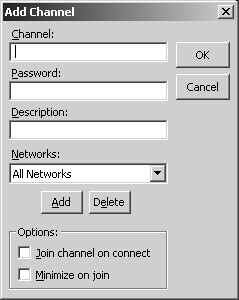 This port forwarding is done in your Router/Hub/Switch/Firewall control program. See your router's manual for exactly how to do this. One example URL is provided below at the end of this document in the section titled Other useful Resources. DCC - Go to File, Options, DCC, Options, DCC Ports (this example assumes that you'll never send more than 10 files at a time. If you need more, set the "First" port number to a lower number. mIRC comes configured to use ports 1024 to 5000 for DCC which is too broad for many firewalls to allow. It's also not as secure as a narrower range (this example) provides. c) Click OK, and then quit mIRC. On your Router/Hub/Switch/Firewall set port range to same ports as set above, and IP to the computer that you want to use mIRC DCC on. Here is my setup on my ZyXEL hardware firewall. Note that there are two PC's setup for DCC in this illustration. Here is my setup on my Kerio ver 2.14 software firewall. Tiny 2.15 is similar. Don't ask me about BlackIce Defender, Symantec Personal Firewall or Zone Alarm (Pro) as I don't/haven't used them. Be sure to double check these settings as this is the single most common failure point!